Last week I passed the 40k mark on my work in progress and my protagonist finally got her first look at the antagonist who until this point in her life had only been the subject of scary stories told around the hearth fire. The full horror of what she is up against finally hits her and she realizes that sometimes reality is much worse than stories. From the picture I found that inspired me you can get a small taste of how imposing of a figure the antagonist is. I'm a good fifty pages into Voices of Dragons and it just isn't pulling me in yet. Have any of you read it? I'd love to hear your thoughts on it. At this point I'm not sure if I'll stick with it so if you've read it and it get's better let me know! Last week I listened to a new CD I received for Christmas so I've been listening to it a lot. It's by Lisa of Celtic Woman. What inspired you last week? Were you able to get back into the writing groove easily after the holidays? If you know who the artist of this alluring painting is please let me know so I can give them credit! I searched all over but couldn't figure out who it was done by. Jury's still out on the new writing groove. It's not likely to get laid down until the end of this week, but I have no doubts. Does that count??? I read a lot of new books over the holiday and these books inspired me to write better for myself, differently, and with more imagination. It absolutely counts Linda! You'll get there then things will start flowing! That's great Lydia! I love it when a good craft book can inspire me and help me improve my craft! Well, I have gotten a little accomplished, but my kids are still off for another whole week!! Sounds like you're at an exciting point in your own book. Good luck!! Oh and haven't read that Dragon one - I'm on to Beautiful Darkness and can't wait!!! Loved Beautiful Creatures, if you haven't read it you SHOULD. I imagine it is very hard to get much writing done with little ones under foot. LOL! Thanks for the good luck, I'll take it! I have read Beautiful Creatures and I loved it. I've read the next one too, you're going to love it even more. I managed to finish a deadline I set for myself over the holidays. It was tough to do but the chapters have been sent out to a publisher and I'm feeling pretty good about it!! Thanks Christy! Congrats on getting so much written! ABNA is an excellent motivator. You'll get done by then I know it! That's fantastic Jen! Congrats on meeting your writing goal during the holidays, that is no easy feat! Not into the groove yet. On anything. But soon. I'm so excited about your new story. I did not make my first resolution. Novel not done. But I am not giving up! Thanks for the motivation! Congrats on reaching 40 K.
I've heard mixed feedback on Voices of Dragons which made me decide not to read it. Hope it gets better. I'm always afraid of giving up on a book just in case it ends up rocking. You'll get there soon Karlene, I know it! Hang in there. Thanks Stina! I'll let you know how VOD turns out! I was in more of a proofreading post-holiday groove, which isn't quite as much fun as a writing groove, but I'm hoping soon to get back into a writing groove. True Alissa, not quite as fun, but still fun! Here's hoping your muse finds their way easily back to you and brings the writing groove with them! Congrats on reaching 40k!! You write so fast and so effortlessly that it makes me a tad jealous, but not in a bad way, an encouraging ay! I'm happy for you! And the books sounds so interesting, I cannot wait to read it one day. The Scribe Sisters are lucky they get to read your WIP! 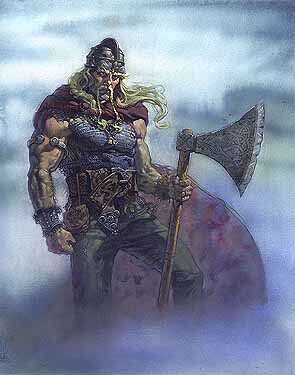 Oh, Heather, I had to grab this picture of the Viking. He makes me think of Bjorn in my novel, when he was human. What a hunk-and-a-half! Good job on the 40K on your WIP. Funny, we must be on same page. I just past it yesterday. I think I'm on 11th chapter, so got a ways to go. But this one isn't going to be as long as the first two. Have a good one everyone! And may the MUSE be with you! Sigh. I haven't been able to get back into the writing/editing groove yet, but I hope by the end of the week I'll be back to it. Vacation wasn't nearly as productive writing-wise as I wanted it to be! Thank you so much Lindsey, you are the sweetest! Lorelei, that's great! I'm glad the picture made you think of one of your characters! That's awesome that we're at the same point in our WIP's! Jamie, thank you so much! It's starting to feel like a book now. As long as you enjoyed your vacation then that's okay if it wasn't writing productive. Hopefully you had a lot of great experiences that you can use in your writing later! Congrats on your WIP; that is wonderful! I hope to hit that sometime next week. I will let you know. I am pushing for 30,000 today. Thanks Michael! Best of luck on reaching 30K today!